I think a totem pole would look good over there and is a great idea! Perhaps something along those lines with some sort of interactive themed attraction around it using the Teepee Footstep. What a shame that the Tee Pee is a goner. 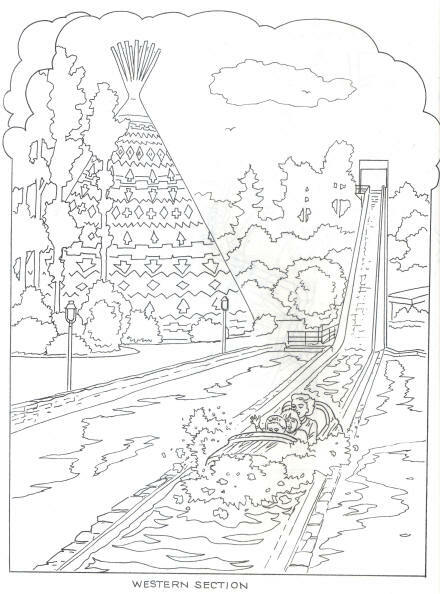 Even though its gone, at least we can visit the Goodtime Alley Page and color a picture of the Super Teepee for the refrigerator door! So it's officially an empty spot now? It just doesn't look the same. That is so sad, I think the management is going too far with ripping stuff out now. The footprint would be a good spot for a drum circle. Get about 20 bongo drums of various sizes and keep it open for sit ins all day. They do it at EPCOT and at Saturday markets in the northwest. Fun! It really doesn't look the same anymore with the Teepee gone. When we rounded to corner coming from Medusa to take a ride on the Runaway Train, we said the same thing that the landscape certainly does look different now. Well I did not mean to imply that. I think they didn't care either way about the Teepee. I thnk they did try to figure something out with the Teepee before this happened. If they hadn't, considering so many rides that weren't functioning were being removied, they most likely would have taken the Teepee out well before the storm that decided its fate. I think that there may have been plans to get it in shape at some point, even if not right now, simply because it was such a unique structure. 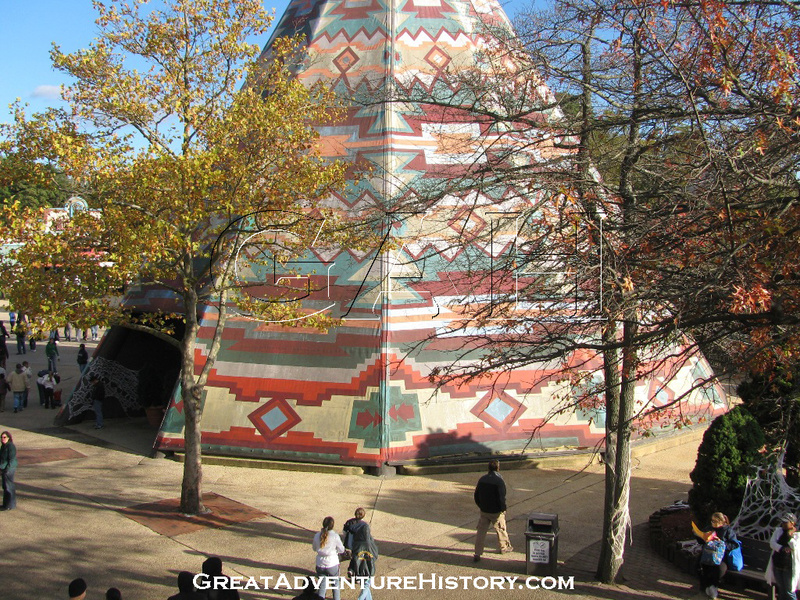 They did care about the Super Teepee, and tried to save it, but the problem is for many years a lot of maintenance was postponed or just not done, to the point of now a lot of the structures and rides need MAJOR investments to be saved. 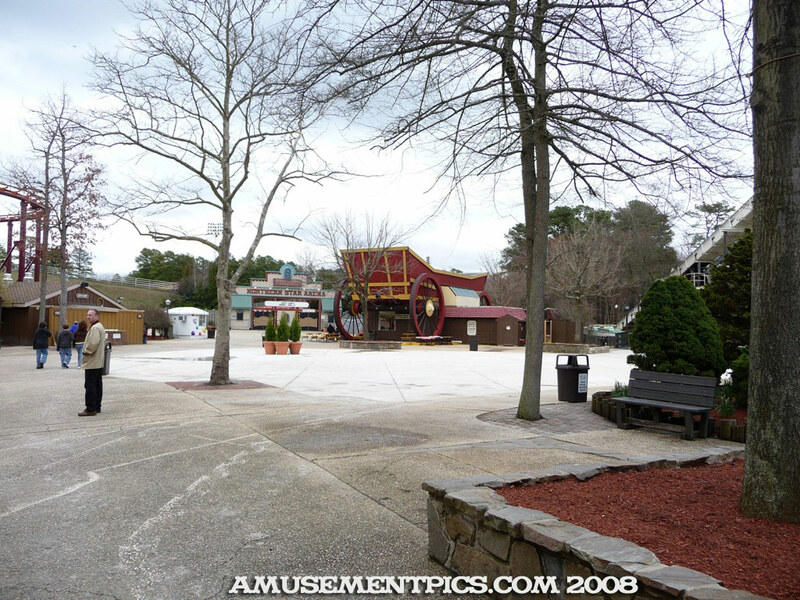 As sad as I am to see the Super Teepee gone, there wasn't much choice, and if it came down to spending money to save the Super Teepee versus spending it to save something else that needed the investment (The Big Wheel, The Skyride, Runaway Mine Train, etc. ), it was a sacrifice that was well worth it. Well the logs were rotted, there is not much you can do about that excpet replace it. The problem was it was a flawed design, putting logs into the ground like that was dumb. But the Teepee probably won't be replaced anytime soon. If they ever do build a new Super Teepee it should be a steel frame painted to look like logs. Well the new concrete does have the electrical wiring run through it so my guess is we will be hearing about the Teepee's replacement in the near future. Clearly they have something in mind to have run that wiring and just leave it blocked off with planters. Seems like more would have been done to protect that if something were not in the works. Sad to see it go. But it really did last a long time considering it was made from logs rather than steel. Hopefully in the near future it can be replaced with something similar. Well I am sure they would want to keep the power service their for some future project for that spot. Only time will tell what will be going there. I realized the HUGE advantage to the Teepee not being there will be during Fright Fest when that walkway gets so crowded normally. Good Point. They could in theory too place one of their smaller shows in that spot or something like that if they wanted, but there will certainloy be more walking room all season long. The teepee's old crown is still on the property, it can be seen at the end of Medusa. Really? I haven't seen that but will be on the lookout for it. You can see the Super TeePee canvas skin on pallets from Nitro. 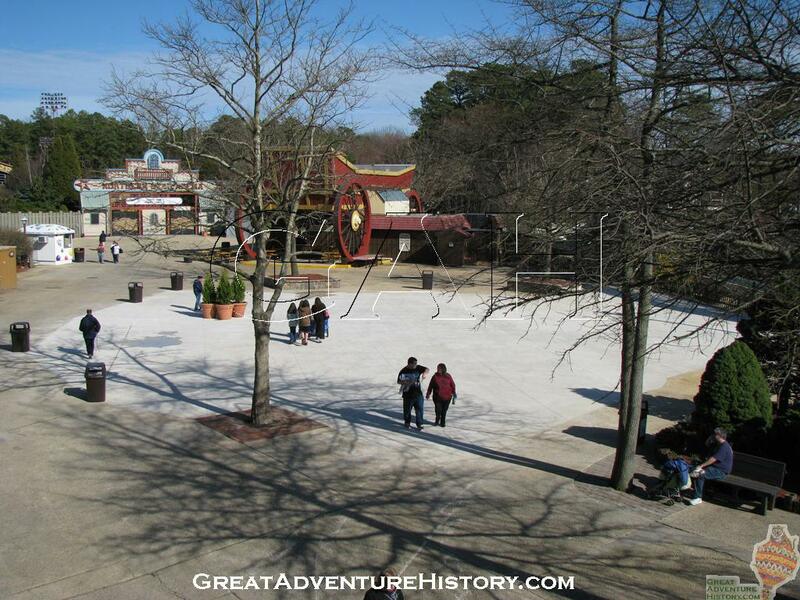 Teepee's top is directly to the side of the break run of Medusa. I wonder if they have plans for it at this point. 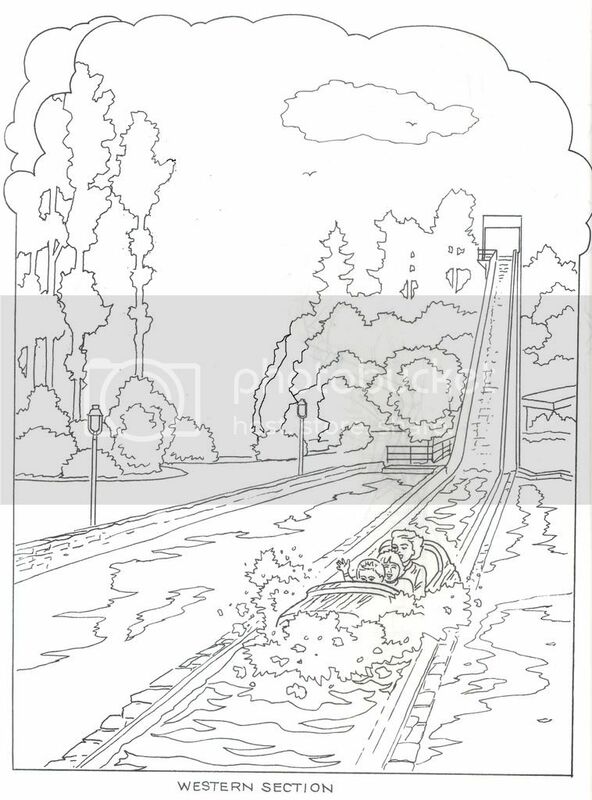 If a flat ride (which I think a western themed scrambler could look nice) goes into the footprint there they could use the top in the ride theming! 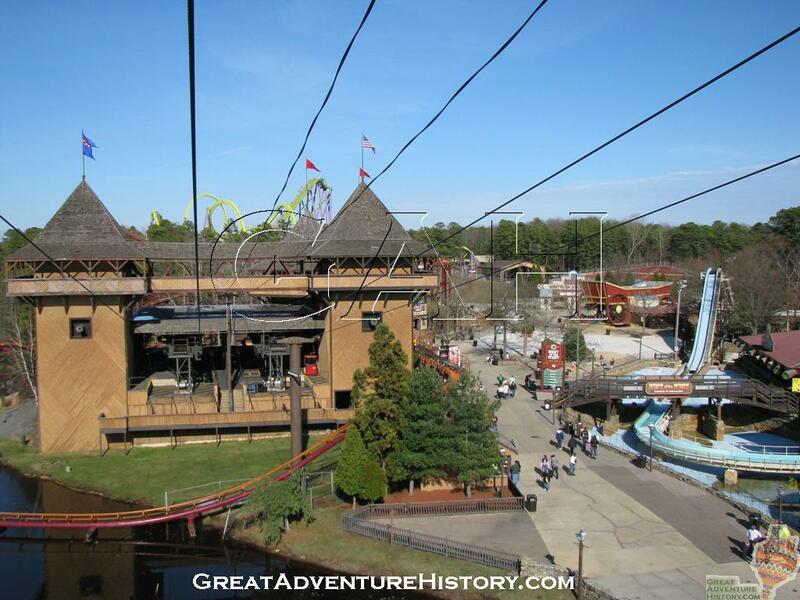 I would like to see a new Teepee there...but if they can't do that, then a Condor or Drop Tower. The queue would just wrap around the ride, it can fit. But it would make the area a little more crowded! ^You know I really love the idea of the indoor scrambler themed to Native American tribal rituals or something like that. I think it could work out quite well and would be a pretty simple ride to set up.